Whether you’re moving into a new home or one of your old household machines crashed, home appliances are essential. Firstly, because you purchase them once every few years, for continuous usage. Then, they need to be reliable, every time you use them. Therefore, you should document, plan and strategize your next home appliances purchase. According to their definition, home appliances cover up the cooling/heating, cleaning and cooking in your home. Even if they are electrical or mechanical, appliances make an investment that you need to carefully consider. Let’s see the 5 basics of purchasing home appliances and making the most of them. Other said, buy appliances for what you are, not what you plan to become. If you love cooking and dream of becoming a chef, but you live in a two-bedrooms apartment, an extra-large oven won’t be space efficient. Purchase home appliances that are adjusted to the size of the room they’ll be in. Consider products such as a low profile air conditioner for your garage or bedroom, and you’ll also notice that you won’t have overcooling issues, as you do with oversized products. So, first measure the space available for your next home appliance. Repeat the measurement after an hour, to make sure it is accurate. Take your notes with you when visiting stores and only look for the products that fit in the designated space. Home appliance products which are energy efficient are usually slightly more expensive than other models. However, they are meant for heavy usage. So, if you plan to use your laundry washing machine at least three times a week, you might consider investing in such a model. The product you purchase must contain the Energy Star logo, which certifies the amount of energy it consumes yearly. Energy-efficient products are environment-friendly, and they will compensate through lower power bills. Kitchen appliances: fall and winter, especially September and October. Dishwashers: December and January, Labor Day, Memorial Day. Gas grills: October – December. 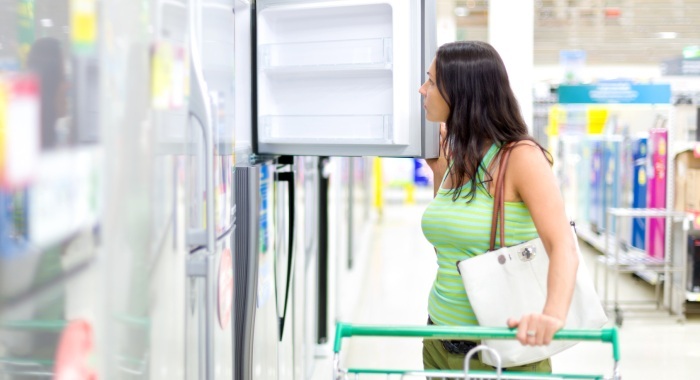 According to a study, customers usually first decide on the brand of their next home appliance. Then, they look for the right retailer. However, reality shows that many consider aesthetics an important feature of their products. Yes, your kitchen or bathroom needs to look coherent. However, a red or blue product might not be better than a white one. Choose white, or black or stainless steel. Before purchasing, remember that grates and knobs are aesthetic factors, not functional. You are buying that product for its long-term functionality and reliability. You buy a home appliance for your family’s needs. There are various aspects that might raise usage difficulties, such as the decibels levels, on which side or how easy the door opens and many others. Consider which are the products’ features and specs that you should look for. You can ask your friends for reviews or look online for customer comments. However, also look for the performance safety tests on each product. Warranty: Although the extended version might seem reliable, it also makes the product more expensive. These are usually fit for oversized home appliances or purchases for restaurants, rather than home usage. Accessories: You might need proper venting for your laundry machine or updates of the floor to place a new product. Ask for all the accessories before purchasing. Bargains: Don’t fall for the tag price. Most salespersons are eager to bargain and offer deals. Transport: If you have your own vehicle and help, you might skip the transport service for the home appliances. Service: The store you purchase your next appliance from should provide you with contact details of specialists who can service it. This varies by location and brand. You will need repairs at some point and only specialists can guarantee that your product will work accordingly afterwards. Purchasing home appliances is both demanding and fun. It requires your full attention and a thorough research. However, when you test the product, you will know if it suits you. Home appliances need to be reliable and useful – that’s what you buy them for. Even if you get an outlet-type product, your new appliance might just have an additional feature than your last one. This function might save you even more time. Plan a week for your future home appliance purchase project and then enjoy it!